The Administration for Community Living (ACL) has funded NCOA to continue to provide technical assistance as the National Falls Prevention Resource Center and the National Chronic Disease Self-Management Education (CDSME) Resource Center. See ACL’s announcement to learn more about their 23 state and tribal grantees. View over 150 resources collected from organizations implementing CDSME programs across the U.S. Find resources focused on leadership, management, partnerships, capacity building, centralized and coordinated logistical processes, business planning, and evaluation. NCOA’s Falls Free® Initiative is hosting photo and video contests! We’re looking for positive images of older adults engaged in a variety of falls prevention activities, such as balance and exercise classes or fall risk screening events, as well as testimonials or interviews with older adults. The winners will be awarded prizes and their photos and videos will be used to increase awareness about falls prevention. Before leaving for a seven-week recess, Congressional appropriators approved bills that provide the same level of funding for falls prevention and CDSME initiatives as previous years. The Senate also proposed a $115,000 (or 0.6%) increase in Older Americans Act Title III-D Preventive Health funding. Learn more about the appropriations legislation, next steps in the process, and how you can help educate your Congressional delegation about healthy aging programs. Our 6 Steps to Prevent a Fall video recently won a national award. The 90-second video offers easy tips to help older adults reduce their risk of a fall. It’s available in both English and Spanish. Stanford, HealthCore, Anthem, and NCOA partnered to examine the translation of the Stanford Diabetes Self-Management Program, both in-person and online. The study, published in the Journal of Medical Internet Research, shows the effectiveness of the program. Six months after completing the program, participants reported statistically significant improvements in 6 of 7 health indicators. The National Falls Prevention Resource Center has updated our falls prevention resources with new statistics from the CDC. Share the 6 Steps to Prevent a Fall infographics to educate older adults about six easy steps they can take to reduce a fall. Share the Falls Prevention Fact Sheet and the Public Policy Falls Prevention Issue Brief to educate professionals and advocates about falls prevention initiatives and funding. The Healthier Living Alumni Community is an online space for people who have completed a self-management education program. Through the online community, program graduates can access tools, practice what they learned in the workshop, and get support from others. The Rehabilitation Research and Training Center at the University of Washington has developed a series of fact sheets for aging well with a physical disability. Fact sheet topics include how to stay physically active, prevent falls, manage your energy, and get the most out of your health care visits. The new Centers for Disease Control and Prevention (CDC) portal provides a way to search data on the health and well-being of older adults nationally or by state. Use the portal to develop custom visualizations, data downloads, and much more. National Immunization Awareness Month: Visit NCOA’s Flu + You website for educational materials about the seriousness of influenza for older adults, the importance of prevention, and available vaccine options. Focus groups with pharmacists on falls prevention: Learn more about the CDC’s upcoming focus groups in Washington, DC (July 26) and San Diego (July 28) to gather information from pharmacists on how to manage medications and prevent falls. CDSME Master Training: Share information about the upcoming training in Spokane, WA on Sept. 27-30. Matter of Balance training opportunities: Register for trainer sessions in Portland, ME on Oct. 13-14 and Dec. 7-8. FallsTalk leader trainings: Attend FallsTalk trainings in Washington in August and Connecticut in September. Click ‘Learn more about offering FallsTalk & FallScape’ on their website to register. Funding opportunity for Centers for Independent Living: Learn more about this funding opportunity for Centers for Independent Living to expand service to Native Americans with disabilities living in Indian Country. 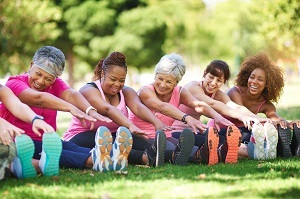 Tip sheet for exercising with chronic or acute pain: Read these tips from Go4Life/National Institute on Aging about how exercise can be an effective way to manage and/or reduce pain. Falling and serious injury in elderly tied to changes in blood pressure lowering meds: Read this study which found that antihypertensive medication initiation and dose increases are associated with a short-term increased risk of serious fall injuries. Strategies for funding community health workers (CHWs) through Medicaid: Learn how Massachusetts, Minnesota, and New Mexico have funded CHWs through Medicaid and what you can do to sustain CHWs in your state. Video: Tai Chi for Elders: Hear Native American elders discuss the benefits of Tai Chi for improving balance and preventing falls. Workplace wellness programs can reduce stress: Read this NPR article exploring employer approaches to reducing stress in the workplace. Stress has been shown to increase the risk of heart disease, obesity, diabetes, and a number of behavioral health problems. © 2016 National Council on Aging, Inc. All rights reserved. Unauthorized use prohibited. May not be reproduced in whole or in part by persons, organizations, or corporations other than NCOA, its affiliates, divisions, and units without the prior written permission of an authorized officer of NCOA. For permission, please contact newsletters@ncoa.org.